Glider is made from a fuzzy pink material with flecks of blue and purple and a white face and chin. She has large sparkly pink and black button eyes and an orange beak. She has shiny pink feet. Then I make a big splash and that’s lots of fun. Glider was introduced in September 2015. Her birthday is on 4th August. This is the regular 6″ version of Glider. 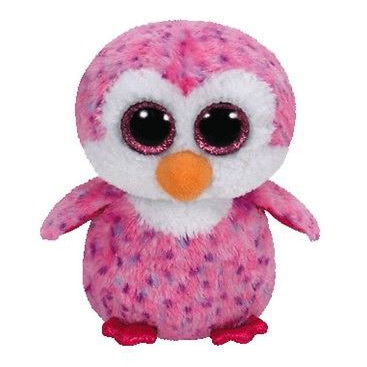 She was also released as a larger 9″ Beanie Boo Buddy and as a key clip.